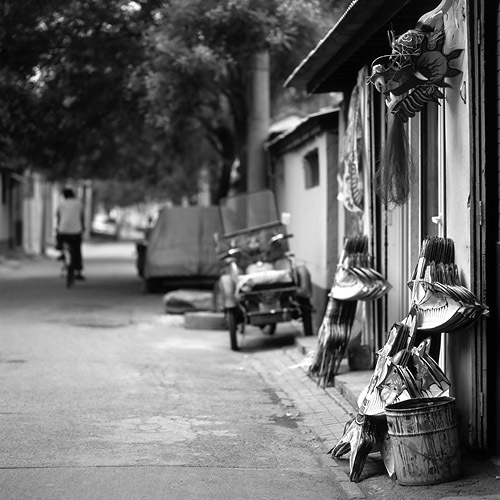 A Hutong is an ancient city alley or lane typical for Beijing. Hutongs possess an incredible wealth of cultural heritage, still preserve a unique lifestyle, and, quite interestingly, even ooze creativity. Very naturally, they have been a major attraction for both Chinese and foreign photographers. 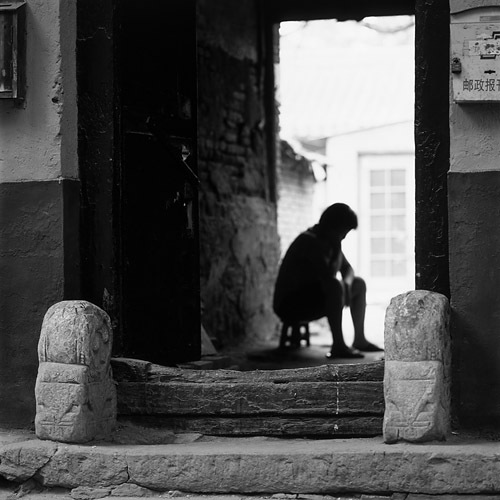 Hutongs, however, have been photographed so extensively that finding an alternative way of presenting them photographically is rather challenging. 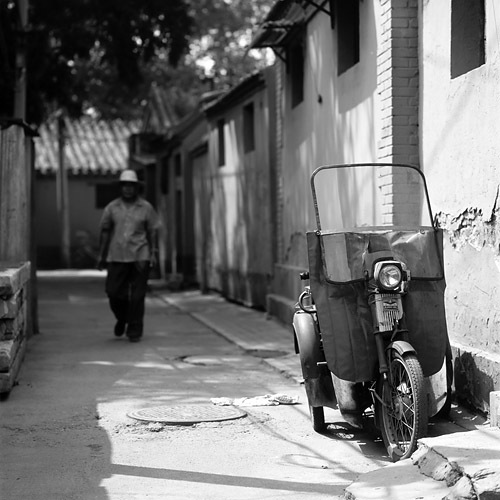 In the end of July 2007 I went photographing in Beijing and, although my initial plans were different, I, in a manner not dissimilar to what Murakami Haruki conveyed in his short story called "Chance Traveller", ended up photographing for two days in Hutongs near Houhai (后海). 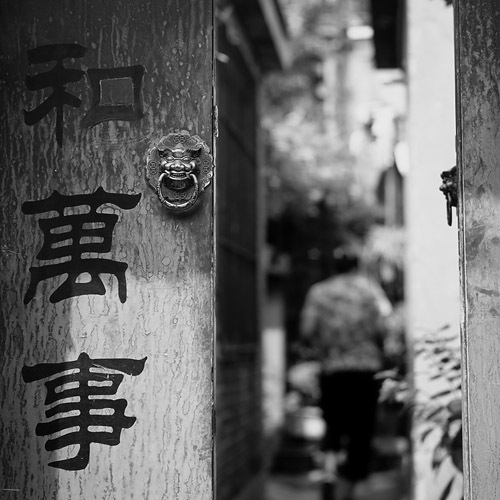 Having seen many photographs of Hutongs and not exactly knowing how to get the creativity juices going, I started off by taking a leisurely walk in the alleys and making a few exposures here and there. I, however, immediately felt that all of them were cliché and a blind repetition of the images I saw before. Cutting myself some slack and considering it a warm-up exercise, I kept on cruising. 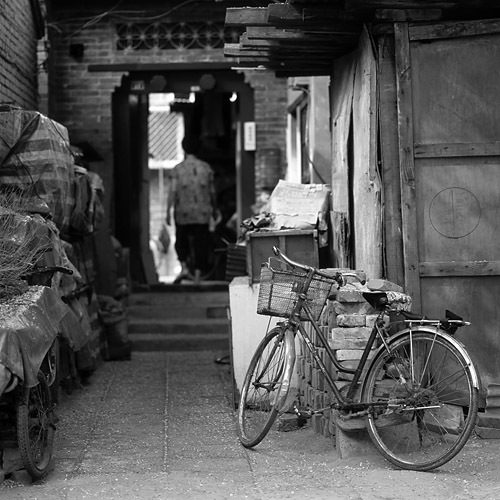 Then, out of the blue (as is always the case with inspiration), an idea popped into my mind - I thought of trying to depict Hutongs by photographing objects and details that are characteristic of the place, constitute an indispensable part of the lifestyle and embody Hutongs' essence. I felt that a creative well was starting to open up but knew that I would have to work on it further to avoid slipping back into the territory of snapshots. Hutongs generally are very cramped and one instinctively reaches out for a wide-angle lens. I, however, decided to isolate the objects that I would choose to photograph by using a telephoto lens wide-open. The idea of using a telephoto lens in a cramped place was not new to me as I explored this approach in Zhouzhuang before. At this point I made a few more exposures but something still felt wrong - there was no vitality in the images, the subjects felt completely and sterilely separated from life as if displayed under glass in a museum. Drawing upon the solution that I found in a similar situation in the past I decided to include people in every image. This time around, however, I put a different spin on it and settled on keeping people in out-of-focus area so that, on the one hand, they breathe vigor into the images and tie them to life and, on the other hand, do not divert attention from the main subjects. And once I thought of this everything seemed to have fallen into place; in my mind's eye I had a clearly pre-visualised image of the Hutongs that I wanted to produce. How did I approach photographing and realising the pre-visualised idea? First I would find an interesting subject and work out a suitable composition that would allow a person to inter the scene far enough so as to be out-of-focus yet remain a harmonious part of the composition. I then focused, set aperture (always f/4) and shutter speed. After that I simply waited until someone entered the scene as I expected and released the shutter. In most cases I was lucky and have the same photo with different people in out-of-focus area; in one instance, though, I chose a relatively abandoned spot, waited too long for someone to appear, got impatient and simply asked a passerby to make me a favour and walk through the alley. On a technical note I have to mention that due to the low magnification the difference between in-focus and out-of-focus areas is much less apparent on-screen than in real-life prints. All images were taken with a Hasselblad 503cw and a CFi 4/150 lens. And of course, a tripod was used for meticulous composition and focusing. This article and photographs do not represent a finished body of work and are only intended to indicate a way of how a creative approach might unfold. The ideas outlined above need to be explored further. For example, all photographs above were taken on colour slide film, scanned and converted to black-and-white in Photoshop. Looking back at it now, I believe I should have used negative black-and-white film instead. (Why film and not digital?) I probably should also consider using either a faster lens or camera movements to further isolate the subjects from their background. Regardless of all this, though, I truly enjoyed finding, exploring and developing an alternative way of creatively depicting a subject that does not lend itself to unconventional presentation easily. Hopefully there will come a time when I will be able to turn this into a full-scale project.